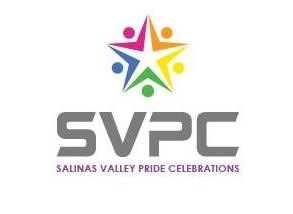 All Middle School & High School LGBTQIA/Ally Students welcome! Meet students throughout Santa Cruz County and beyond — from Watsonville and Salinas to Scotts Valley — who are working to help create safer schools in their community! 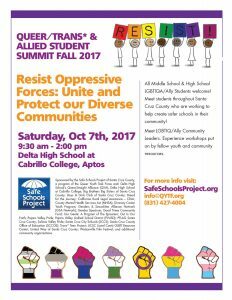 Student leaders and members from the Delta High School Queer-Straight Alliance (QSA) student club selected the theme of “Resist Oppressive Forces: Unite and Protect our Diverse Communities.” Their statement reads: LGBT+ folks come from diverse backgrounds. As a community we must stand together in solidarity, united over our commonalities and celebrating our differences. New for Fall 2017 Summit! Start the 2017 Queer History Month weekend of Oct 6-8 with a weekend full of opportunities for LGBTIQA & Ally Youth!! 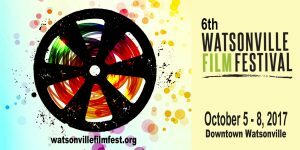 The 2017 Watsonville Film Festival is proud to celebrate two LGBTQ films: Chavela & Raising Zoey — all info and trailers available on the WFF website! 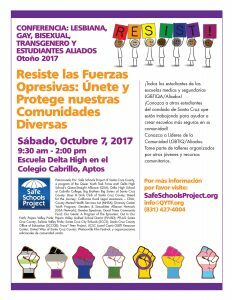 Complimentary tickets for youth — just show up and say you are part of the Safe Schools Project! Register Now – Save your spot! This is the registration form for individual attendees, every individual attending will need to either register online in advance or on the morning of the event. This question is merely for statistical purposes. Answering this will not influence your chance of attending the conference. Watsonville, Aptos, Santa Cruz, etc. Bus, Car, Walking, Carpooling, etc. Vegetarian, Vegan, Omnivore, Pescatarian, etc. Food (e.g. Nuts, Gluten), Environment (e.g. Perfumes, Cigarette Smoke), etc. Answer n/a if not applicable. Where did you hear about the Fall 2017 Queer, Trans* & Allied Student Summit? Should we be discreet when contacting you? Please help distribute flyers widely on campus and community. Thank you!